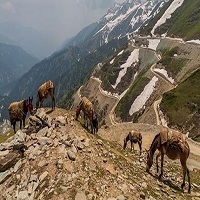 "The Sinthan pass connects Kashmir valley with Jammu Province through Kistwar. It is 12,500 feet (3,800 m) above sea level and is snow-capped for most of the year. It is located at 33Â°34'N and 75Â°30'E at the Anantnag-Kokernag-Kishtwar NH1B Highway, and is 130 km south of Srinagar and 73 km from Anantnag and 48 km from Kokernag. Sinthan Top has no local population." Like other areas of the valley, Sinthan Top is known for its beauty and wonderful tourist attractions. The place is fast growing as one of the top tourist destination in Kashmir. Around 37 kilometers of snaky and uphill drive from Daksum, it offers an adventurous journey. The spot is emerging for mountaineering, trekking and skiing. Sinthan Top is easily accessible from Srinagar.